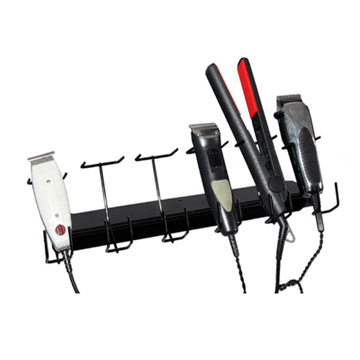 The "Ultimate Rack" is adjustable to hold a variety of sizes and styles of professional tools - hair clippers, curling irons, flat irons or blow dryers. The “Ultimate Rack” is perfect for Barbers, Cosmetologists, and Stylists. Installation Package Included: Instruction, Velcro and Screws . Item # B-3010 — 3 Slot Holder: 7"
Item # B-4010 — 4 Slot Holder: 10.5"
Item # B-6010 — 6 Slot Holder 17"
Choose Rack sizes: 3 Slot Holder: 7" 4 Slot Holder: 10.5" 6 Slot Holder 17"